What distinguishing feature do the world's healthiest and happiest societies have in common? According to acclaimed author Richard Wilkinson, the answer is simple: they have far less income inequality than other societies. In this new film based on his international best-seller The Spirit Level, Wilkinson focuses on why the U.S., despite being one of the richest nations in the world, lags behind so many other rich Western societies in a number of crucial statistical measures -- including life expectancy, violence, health, community, teen pregnancy, mental illness, and incarceration. The reason, he suggests, is that the immense wealth of the U.S. has been unevenly distributed among the American people. Mobilizing years of research, Wilkinson looks at the devastating toll economic inequality is taking on people around the world, and shows that societies with the smallest gaps between rich and poor enjoy the highest levels of health and happiness across all social and economic classes. The result is a timely and accessible reassessment of some of our most cherished socio-economic principles and myths. As one reviewer observed, the research of Wilkinson and his colleagues "will change the way you think about life, liberty, and the pursuit of happiness." Richard Wilkinson has played a formative role in international research on the social determinants of health and on the societal effects of income inequality. He studied economic history at the London School of Economics before training in epidemiology. He is Professor Emeritus of Social Epidemiology at the University of Nottingham Medical School, Honorary Professor at University College London and a Visiting Professor at the University of York. Richard co-wrote The Spirit Level with Kate Pickett which won the 2011 Political Studies Association Publication of the Year Award and the 2010 Bristol Festival of Ideas Prize. Richard is also a co-founder of The Equality Trust. "A most interesting and a valuable contribution. I strongly recommend it & I hope it is widely viewed." 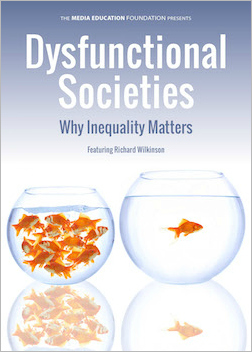 "Professor Wilkinson crafts a story based on the facts and on cogent summaries of social science research, a story accessible to all, about why inequality should be a public policy concern, how it works to erode social inclusion, and the consequences for the social and economic well-being of the citizens in the rich countries." "I have studied income inequality for many years, focusing mainly on its economic implications and recently also on the question what causes high inequality. I was therefore fascinated by the movie Dysfunctional Societies, that broadens the scope much beyond economics, to social aspects, health issues and even mental effects of inequality. I have learned a lot from this movie and I think it sends a very strong message on the various ways that inequality hurts our societies. I was mainly impressed by the effects of inequality on violence. I hope many people will watch this film, will consider more seriously the problem of inequality and hopefully support efforts to reduce inequality."